Last year, I reflected on techniques that support academic writing for a blog post as part of Academic Writing Month. I was struck by how many different techniques are recommended for overcoming ‘writer’s block’, yet it is not often recognised that some techniques will work better for some individuals than others. A recent experience with Lego Serious Play has led me to wonder whether it is possible to minimise the likelihood of experiencing writer’s block in the first place by taking time to fully construct a conceptual model of the piece one is writing. We asked Rachel Stead to facilitate a workshop for our MA Higher Education students taking the Assessment and Feedback module. The final assessment for this module is a 2500-word critique of a model of assessment and/or feedback within their practice, and an evidence-based consideration of an alternative model. In preparation for their summative assessments, they had previously submitted a 500-word outline of their proposed critique, receiving formative feedback from peers and from course tutors. The Lego workshop came two weeks before they were due to present the main argument of their assignment in front of an audience of course tutors and peers, to gain further formative feedback. In one-to-one tutorials with the students, we had seen how they were struggling to get a sense of clarity in their argument, and to keep the overall ‘big picture’ message in mind. These struggles resonated with me, as in my current writing projects I am also grappling with similar issues. For this reason (as well as the opportunity to play with Lego! ), I decided to take part in the workshop activities alongside the students. 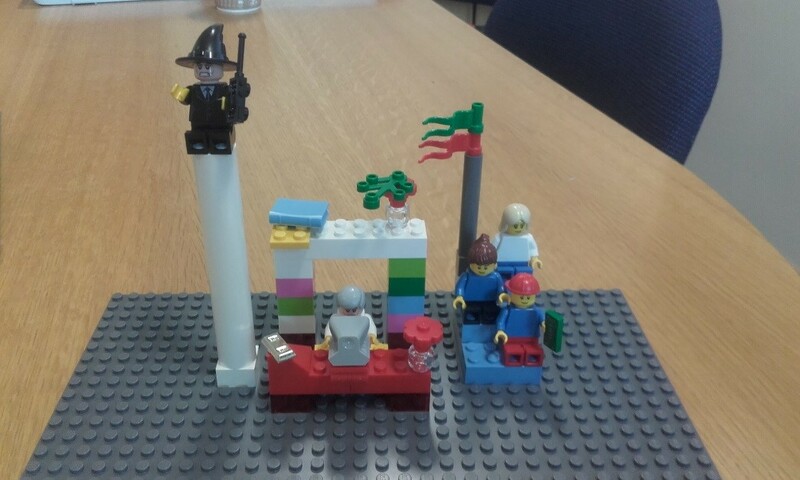 First, Rachel asked us to use Lego to create a representation of the assessment and feedback process. My recent work (e.g. Winstone, Nash, Parker & Rowntree, 2017) has focused on the role of the student in the feedback process, and the provision of opportunities for them to take a more active role. For me, the feedback process is a partnership, with its effectiveness based upon shared responsibility between staff and students (Nash & Winstone, 2017). 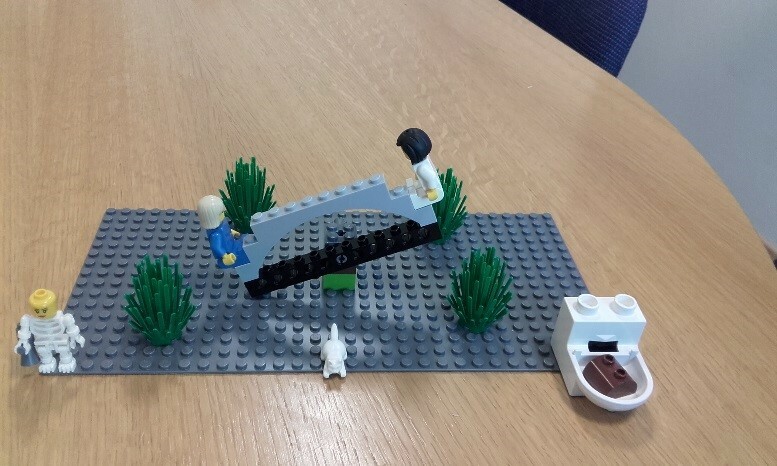 I knew that I wanted to represent this partnership in my model (see image below), and suddenly saw that a good metaphor for the approach we have advocated is a see-saw, with student on one end and tutor on the other. The overall responsibility for making the feedback process effective is evenly shared between student and tutor, but depending on the specific stage of the feedback process, either the tutor or student may take on the larger portion of responsibility. The dynamic nature of the Lego model represented this process well, in a way that a diagram simply could not. The continuation of practices with little evidence for their effectiveness. I represented this with a toilet, illustrating the ‘s**t sandwich’ which is so prevalent in practice (guidance for tutors to frame their critical comments between two pieces of praise). The mutual ‘blame’ in the feedback process, where students are critical of the feedback they receive, perceiving it to be of little use, whilst staff criticise students for not engaging with the feedback they receive. I represented this through ‘Schrodinger’s Feedback Cat’, to illustrate the problem with assumptions we might make about unopened/uncollected feedback. The dominance of a transmission view of feedback, with a focus on feedback as comments, with primary focus on what the tutor does. David Carless terms this the ‘old paradigm’ of feedback, so I represented this with a skeleton holding a megaphone. Next, Rachel asked us to represent the main argument of the writing we were working on. My current writing project focuses on the influence of quality assurance procedures on feedback, where this can lead markers to frame comments with the external examiner, rather than the student, in mind. In modelling these ideas, I placed a tutor at the centre of the model, with the competing audiences on either side. By placing the feedback-giver in the centre of the model, this encouraged me to frame my argument in a way that represents their point of view. This clarity of understanding was a breakthrough for me. I also witnessed the students experiencing a breakthrough in their ideas. By explaining their models, and questioning each other’s representations, I could see something ‘click’. And this made me realise that Lego Serious Play has huge potential as a model for facilitating writing retreats. When writing, I think we so often focus on getting words down on a page, and following a plan, that we can lose sight of the overarching conceptual lenses that inform our arguments. I can see this model providing conceptual clarity to those working on assignments, dissertations, articles, books, and even applications for Senior Fellowship of the Higher Education Academy. The space and opportunity to think differently, to interact viscerally with your ideas, and to deconstruct and reconstruct the arguments, can enable the nuggets of original, transformative thought emerges from the chaos.